There are so many pleasant experiences in this film: the first one is the lack of excitement about its own structure. While some critics and all the non-specific media have made a big deal out of the lengthy production time of the film, when you actually see it, this is not dealt with as such a big deal. It is dealt with casually, the way life passes through time. There is a boy, he grows up, we follow him. Some segments we witness are a bit longer, others a bit shorter, some are a bit more dramatic, others less so. Sometimes we feel there is big drama building up, only to realise that next time all is forgotten. It was just one of those episodes where people argue, but the arguments are not to last, they are mere episodes in a family life. The other nice experience is to witness Ethan Hawke being a good and subtle actor, something I had not seen before. He usually is better in Linklater’s films than in other productions, but even in the “Before…” films I find him slightly obnoxious. In “Boyhood” I can understand his honourable battle for his children, and him using all his creativity and as much of his honesty as he can afford to give to his children without losing his dignity as a father figure. That Patricia Arquette is great is no news, on the other hand, but it is confirmed here. She is bearing a lot of burden, but never loses her love and lovability as a mother and as a woman, as the actual hero of this story, the one person who needs to constantly make decisions that count. The father is mostly just goofing around, hopping in and out of other people’s lives. The others are mere temporary guests. Both kids are mostly content in their role as being on the receiving end of adult decisions. In that sense, if the film was called “Motherhood”, it would be at least as appropriately titled. 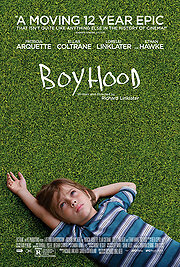 The title role is played by Ellar Coltrane, and he is a pleasant and eerie presence in this: he is a good kid all in all, displays good manners, is a relatively passive observer of the things happening around him and is accepting that as a boy, it’s mostly other people who make the decisions that affect his life severely. The actor Coltrane communicates this with calm demeanour, we don’t see him agitated, even when he gets angry, it is the calm anger of a rather lonely child who has learned to cope with his problems on his own. There are individual scenes of smalltown childhood / teenage horror to be highlighted: maybe the image of the coming-of-age birthday presents rifle / bible “where the words of the Lord Jesus are printed in red” stand out, scenes of loss of old friends, of home after moving again and having to paint over the growth markings on the wall, of betrayal when the son has to realise that the father’s decade-old promise of a certain gift was long forgotten on the father’s part. But mostly it is about the utterly terrifying and wonderful experience of growing up, having to deal with mostly grown-up people who do not quite understand what a kid or teenager is all about, who have no time to learn it and other worries that – then again – a kid won’t understand for a while. And of walking a thin line between being appropriately rebellious and inappropriately endangering your live and that of others through immature actions.